Our state of the art veterinary practice management system has been designed with the assistance of three major vet practices and developed by our programming team using the latest technology available. We have listened to receptionists, accounts personnel, veterinary surgeons, stock controllers and nurses to ensure all aspects of the application are easy to use. The system has many special features and being developed in the latest software environment has allowed us to integrate email, SMS and instant messaging as well as a host of "secret" features. We have spent the last two years talking to veterinary practices in the UK and Ireland to ensure we know the varied requirements of each surgery. We then partnered up a mix of three practices in the UK, a software development company and an IT group. Together we have developed an outstanding product which works equally as well in a small single branch practice as it does in a multi-branch veterinaryhospital environment. Secure enterprise email services on dedicated servers with anti spam filtering, virus checking and Web interface allowing you to be in touch wherever you have internet access. We offer a range of options on purchased or rental servers from simple server racking to fully managed 24/7 resilient server environment. We also offer remote disaster recovery solutions. Our graphic design team create bespoke web sites ranging from the simple to the more complex content managed and e-commerce sites; all developed and programmed by our dedicated team of in-house experts. All our hosting is done within our privately owned data centre in Gloucester. The data centre is fully equipped with FM200 gas fire suppression, air conditioning and diesel power generation. Web sites professionally hosted on our blade environment, with a variety of database engines available. We have many years experience in developing highly successful e-commerce sites. We specialise in top quality hardware, with all systems built on our premises to very high standards, tailored to match your requirements. Talk to us about your requirements; we can support your entire IT infrastructure. Our team of support engineers are able to provide you remote diagnostics and support of all the systems on your network. We also provide support services for your web site and email services. 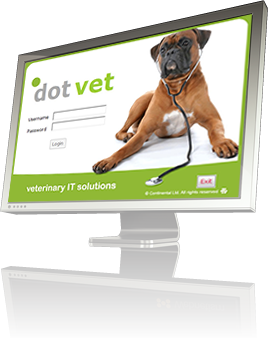 DotVet users have Remote Support available to them, using our own dedicated server. Take me to the Client Portal page. "The clearest screens and the most intuitive system that we have seen"
"The rota and diary give us a good overview of the practice"
"Clinical staff need virtually no training and love the system"
"The ability to vary prices between surgeries and animal groups is very powerful"
"The appointment reports allow us to see exactly what is happening and what has happened, in time for us to do something about it"
"The referral facility makes it very simple to communicate with vets who have referred to us or to whom we have referred animals"
"The hosted solution keeps capital costs down and yet is very secure"